In 1965, at seventy years of age, he ventured outside India for the first time to fulfill the order of his spiritual master. During his voyage at sea, he suffered two severe heart attacks. He reached the shores of America with the equivalent of seven dollars to his name. He founded the International Society for Krsna Consciousness with a small group of disciples, after a year of struggling alone in New York City. This marked the only time in history that a Krsna devotee successfully trained non-Indians in the strict disciplines of Vaisnavism. Amazingly, this was achieved during the blossoming of America’s hedonistic counterculture movement. 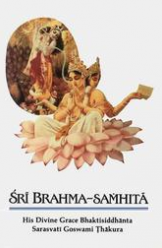 Recently there was a post on Dandavats with a letter (at bottom of post) by the BBT Communications Team trying to justify their attempts to stop the distribution of the newly printed Original Srimad-Bhagavatams that Jitarati Prabhu has printed. I read the article with some interest, just to hear their argument and justification, for trying to stop the distribution of this fine set. But what was more interesting to me was the nice comment posted by Padmapani Prabhu. Hare Krishna Prabhus. Thank you for airing this matter publicly. I’ve been deluged with inquiries from concerned devotees around the world about this conflict and I’d like to get a better understanding of the details so that I can respond accurately. 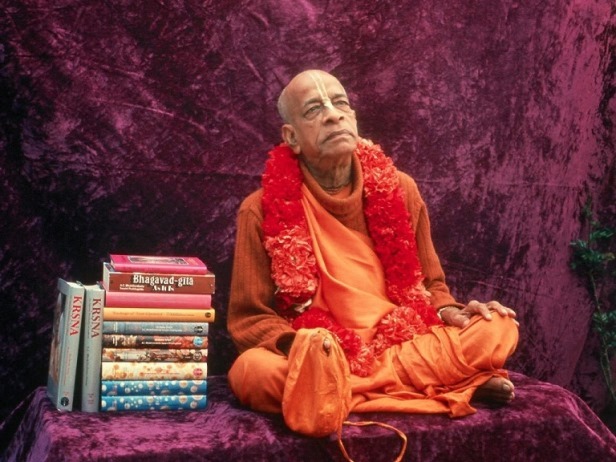 I was under the impression that devotees had reached an amicable agreement after the last court case that KBI (Krishna Books Inc.) could legally print Srila Prabhupada’s original books, so I was surprised and dismayed to learn that there is yet another court case on the horizon. Surely devotees can somehow or other work this out co-operatively between one another without resorting to expensive lawyers and creating even more bad publicity for Srila Prabhupada’s movement. On a personal note, I’d like to mention that I served with Jitarati Prabhu back in the 70’s in both the Winnipeg and Montreal yatras. 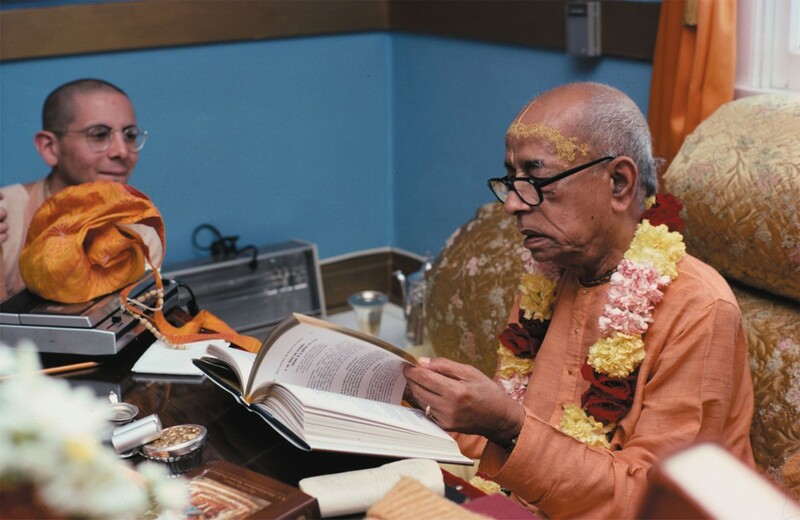 Due to Jitarati’s leadership and dedication to sankirtana, the Winnipeg temple was consistently number one in distributing Srila Prabhupada’s books for years in the small temple category. Later Jitarati helped to spearhead large-scale collections for remodeling the old church in Montreal which is now the beautiful home of Sri Sri Radha Manohara. Although I haven’t seen Jitarati Prabhu for at least 40 years, I always remember him as a sincere and devoted disciple of Srila Prabhupada. 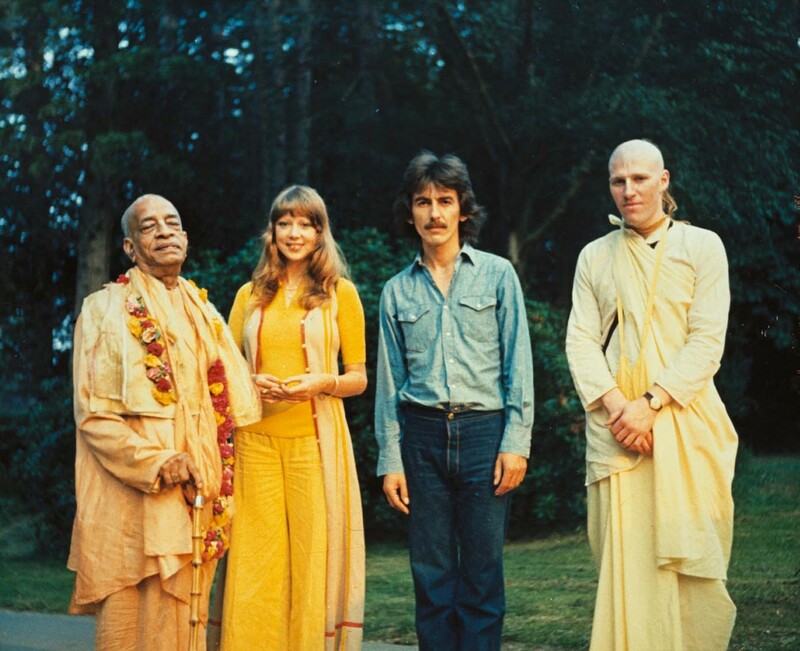 We all have our own slants in Krishna Consciousness, but Srila Prabhupada repeatedly told us that we should try and work together despite our differences. I know from personal experience in publishing a magazine for devotees back in the 80’s (The Vaisnava Journal) that we can get along no matter how far apart we might be on personal or philosophical issues. Devotees of all persuasions and from all camps — including the GBC — were communicating together on the same page, so I know it can be done. Where there’s a will there’s a way. Below are but a few of the many quotes from Srila Prabhupada which I hope will remind us all of the bigger picture and our collective duty to His Divine Grace. Thank you for listening. 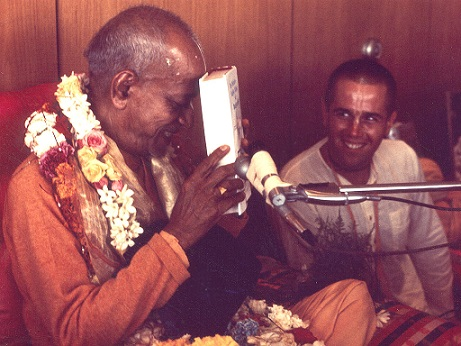 One day, when I was first with His Divine Grace in L.A., Brahmananda Prabhu came from New York and they were talking about the printing of a Bhagavad Gita with Sanskrit included. Evidently, there was a question as to whether the western people could pronounce the transliteration with diacritic marks. Srila Prabhupad rang his bell, and I came into his room. Brahmananda was there. Srila Prabhupad handed me a paper with Sanskrit transliteration and said “Read this!” I have been able to read since I was three, so evidently, I made the pronunciations close enough. 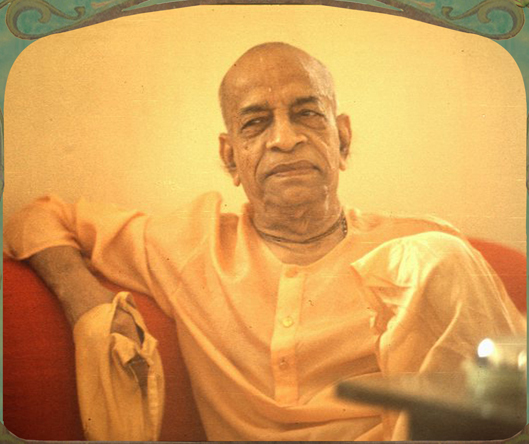 Srila Prabhupad said to Brahmananda, with great enthusiasm, “See! I told you they could do it!” He was very happy. In His amazing way of innocence and childlike excitement, He took it and held it to His head, saying “Jai! Jai!” It was awesome to be present for such an important and empowering moment. Srila Prabhupad was so kind to me. Even though I was/am a deeply entrenched rascal, He has engaged me so many times in wonderful service. All Glories to Srila Prabhupad! Last night I noticed that the moon was full, and it reminded me that this must be Balarama Rasayatra, or the night that Lord Balarama danced the Rasa dance with the Gopis. 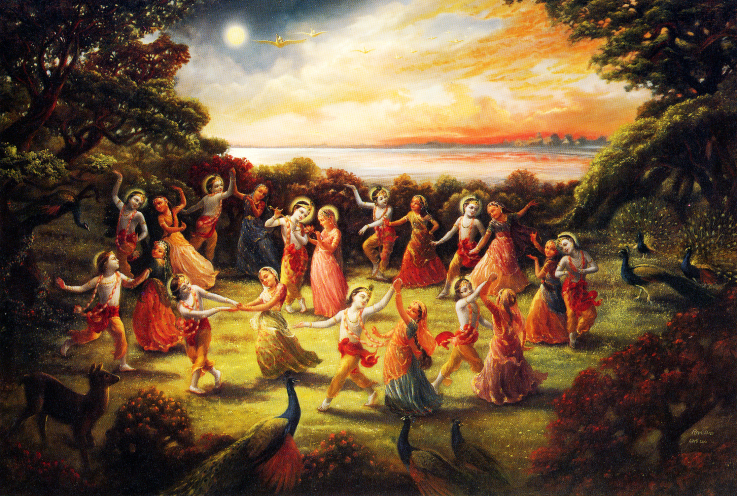 It was also Sri Krsna Vasanta Rasa, the Lord’s springtime rasa lila pastime. 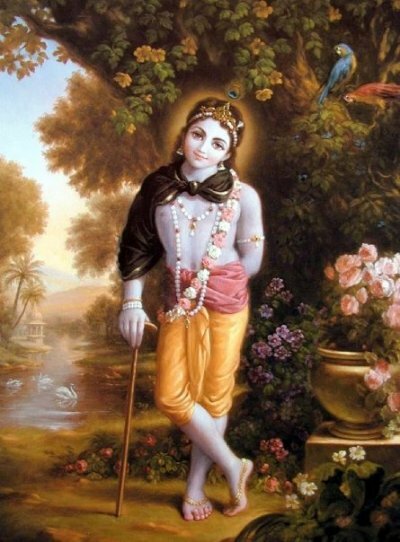 We honor these pastimes with a chapter from the Krsna Book, entitled “Lord Balarama Visits Vrndavana”. …Lord Balarāma could, of course, understand the ecstatic feelings of the gopīs, and therefore He wanted to pacify them. He was expert in presenting an appeal, and thus, treating the gopīs very respectfully, He began to narrate the stories of Kṛṣṇa so tactfully that the gopīs became satisfied. In order to keep the gopīs in Vṛndāvana satisfied, Lord Balarāma stayed there continually for two months, namely the months of Caitra (March-April) and Vaiśākha (April-May). 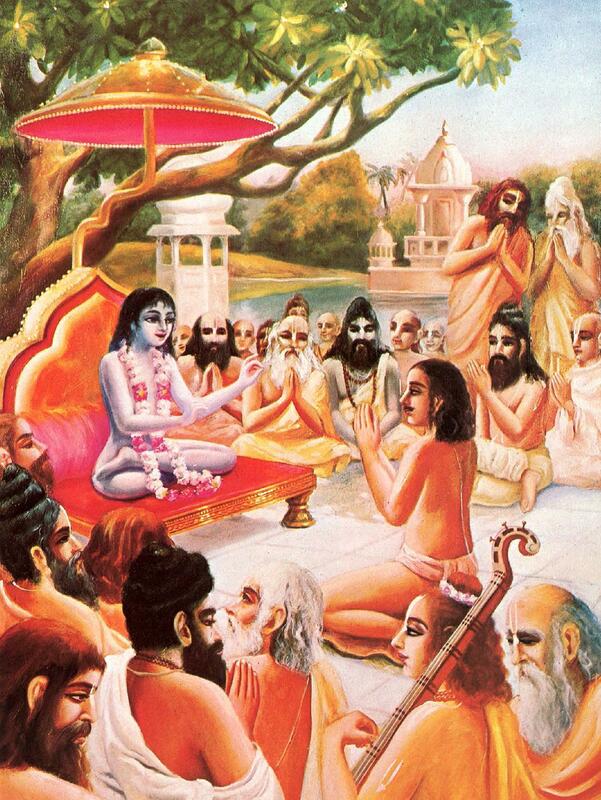 For those two months He kept Himself among the gopīs, and He passed every night with them in the forest of Vṛndāvana in order to satisfy their desire for conjugal love. Thus Balarāma also enjoyed the rāsa dance with the gopīs during those two months. Since the season was springtime, the breeze on the bank of the Yamunā was blowing very mildly, carrying the aroma of different flowers, especially of the flower known as kaumudī. Moonlight filled the sky and spread everywhere, and thus the banks of the Yamunā appeared to be very bright and pleasing, and Lord Balarāma enjoyed the company of the gopīs there. With the advent of the Gaura Purnima, or the Appearance day of Lord Caitanya, rapidly approaching, I thought it would be nice to again offer the free pdf file of the Teachings of Lord Chaitanya. Just click on link to read it online or save it to your computer. Hare Krishna! 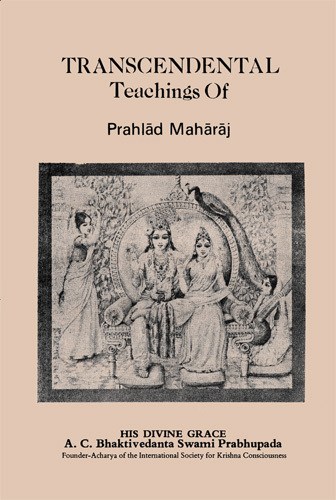 For some reason (supersoul, I guess), I have been reading the “Transcendental Teachings of Prahlada Maharaja”. There are so many books on my shelves, but I searched for this small paper back book amongst the many small books in our library. We have included it here today as a post. You can also download it as a free pdf file, or as a scanned pdf of the original. Just click on following links to download. The following is based on a series of talks Śrīla Prabhupāda gave in 1968 on the Śrīmad-Bhāgavatam, Canto 7, Chapter 6. First of all, let me offer my humble, respectful obeisances unto the lotus feet of my spiritual master, His Divine Grace Śrī Śrīmad Bhaktisiddhānta Sarasvatī Gosvāmī Prabhupāda. Sometime in the year 1935 when His Divine Grace was staying at Rādhā-kuṇḍa, I went to see him from Bombay. 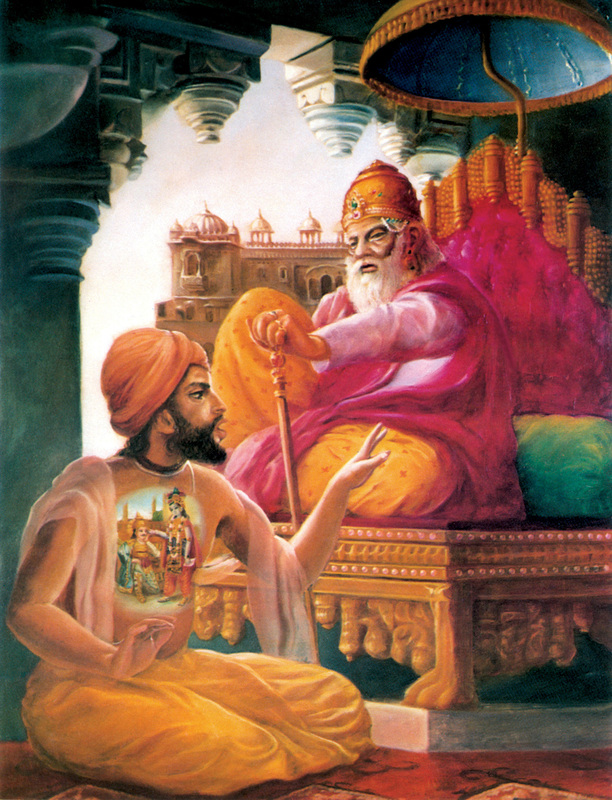 At that time, he gave me many important instructions in regard to constructing temples and publishing books. He personally told me that publishing books is more important than constructing temples. Of course, those same instructions remained within my mind for many years. In 1944 I began publishing my Back to Godhead, and when I retired from family life in 1958 I began publishing Śrīmad-Bhāgavatam in Delhi. When three parts of Śrīmad-Bhāgavatam had been published in India, I then started for the United States of America on the thirteenth of August, 1965. I am continuously trying to publish books, as suggested by my spiritual master. Now, in this year, 1976, I have completed the Seventh Canto of Śrīmad-Bhāgavatam, and a summary of the Tenth Canto has already been published as Kṛṣṇa, the Supreme Personality of Godhead. Still, the Eighth Canto, Ninth Canto, Tenth Canto, Eleventh Canto and Twelfth Canto are yet to be published. On this occasion, therefore, I am praying to my spiritual master to give me strength to finish this work. I am neither a great scholar nor a great devotee; I am simply a humble servant of my spiritual master, and to the best of my ability I am trying to please him by publishing these books, with the cooperation of my disciples in America. Fortunately, scholars all over the world are appreciating these publications. Let us cooperatively publish more and more volumes of Śrīmad-Bhāgavatam just to please His Divine Grace Bhaktisiddhānta Sarasvatī Ṭhākura. … …That is the gift of Lord Caitanya Mahāprabhu. It is in the śāstra. Caitanya Mahāprabhu does not give you anything which is not in the śāstra. He’s ācārya, although He’s God Himself. He can make śāstra. Whatever He does, whatever He speaks, that is śāstra. But still, because He’s playing the part of ācārya, He immediately gives Vedic evidences. That is the way of ācārya. Ācāryas will never say, “I think.” “It is in my opinion.” No. Such things are not accepted. No personal opinion. It must be supported by Vedic evidences. That is called paramparā system, genuine system of understanding. As Kṛṣṇa says, evaṁ paramparā-prāptam imaṁ rājarṣayo viduḥ [Bg. 4.2]. No change. Therefore we are presenting Bhagavad-gītā as it is. We do not change. We have no power to change. Then where is the authority of Bhagavad-gītā? I am a third-class man, and if I change the statements in the Bhagavad-gītā, then where is the authority of Bhagavad-gītā? That is going on. 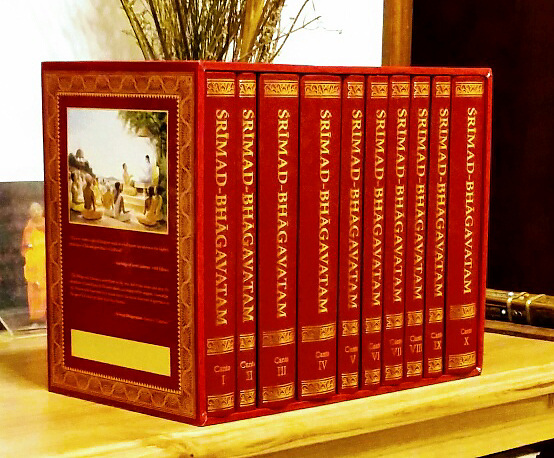 Therefore it is practically… You have got experience that there are hundreds of Bhagavad-gītā editions in the Western countries, but because we are presenting Bhagavad-gītā as it is, our sale is better than all others. There is a report from the trade manager of Macmillan. He says, “While other editions are dwindling, going down, this edition is coming up.” They published our, this present enlarged edition of Bhagavad-gītā, fifty thousand in the month of August. They are going to print again, second edition, August, September, October. So the reason is that if we present things as they are, it will be accepted. Without any adulteration. Sometimes, you know, people say that I have done miracles. They say everywhere. But I do not know anything, miracles or magic. If there is any miracle, that miracle is that we present things as they are. That’s all. Without any adulteration. So that should be the principle. Present as it is. It will be accepted. Sometime back I saw this article on the Prabhupada News website that I saved to my files because it is a good assortment of quotes. I am always happy to see Srila Prabhupada’s books being distributed. When I saw this book distribution report on facebook, I couldn’t help but post it here. ISKCON Bangalore seems to be doing an outstanding job distributing these transcendental books, and in 5 different languages as well! Very inspiring. 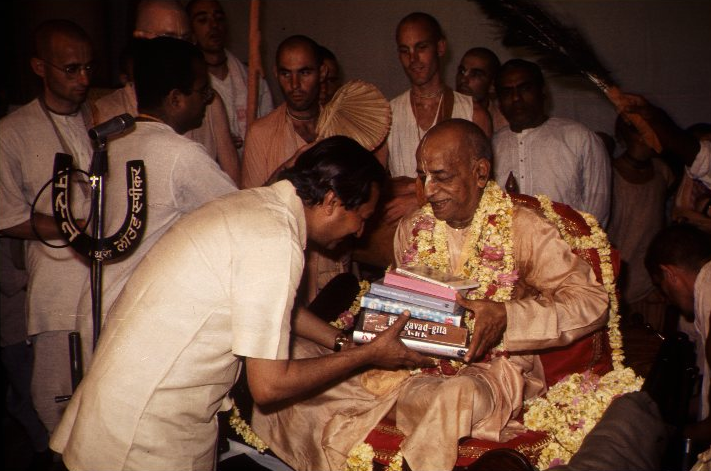 Glories to all of Srila Prabhupada’s book distributors. Hare Krishna! The book marathon program of ISKCON Sri Radha Krishna temple, Bangalore which commenced on 7th Dec 2014 during the auspicious occasion of Gita Jayanti, went on till 8th Feb 2015 and concluded with a prize distribution ceremony on 15th Feb, 2015. Book distribution is one of the major activities of ISKCON centers around the world as it was the desire of Srila Prabhupada, the founder-acharya of ISKCON to spread the teachings of Vedic literature all over the world by distributing his books to the people at large as ordered by his spiritual master, Srila Bhaktisiddhanta Saraswati Thakura. 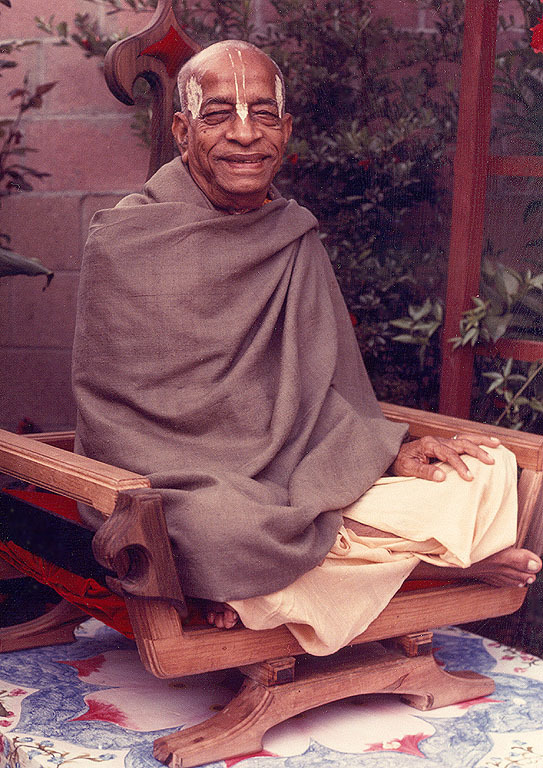 In fact, Srila Prabhupada considered it as his life and soul. He instructed, guided and encouraged his disciples to engage in book distribution more and more and that would please him very much. 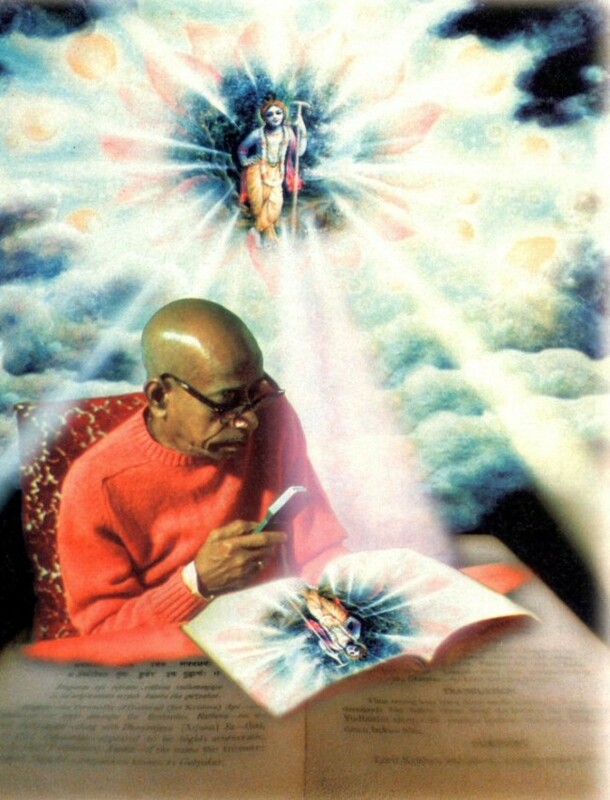 I guess we all have our favorite verse or sloka from Srila Prabhupada’s books, and a favorite picture as well. This is probably my favorite verse from the Srimad Bhagavatam. It speaks to me, and I find that I quote this verse often when I am speaking with others about the joyous nature of Krishna consciousness. I will be away from the computer for the next few weeks as we are taking a ‘spring break’, but I wanted our last post to be about Remembering Krishna. This is an older compilation of quotes and excerpts that first appeared on BookChanges.com back in 2009. I do not think one can overemphasize the importance of the Book Change issue. This is the way of receiving transcendental knowledge. In case anyone missed this important 1979 interview with Ramesvara Prabhu, on the History of ISKCON, Book Changes, Book Publication, etc., etc. We are re-posting again. A very, very important document has just become public. 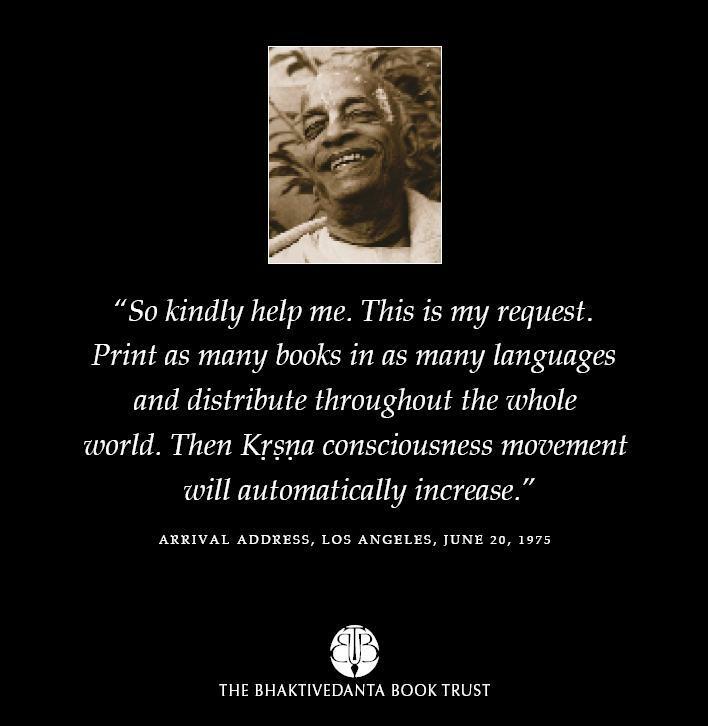 It is a 300+ page transcript of a 1979 interview betweem Baladeva Vidyabhusana Prabhu and Ramesvara Prabhu, the manager of the Bhaktivedanta Book Trust, the person who was directly in charge of printing Srila Prabhupada’s books durning that time. 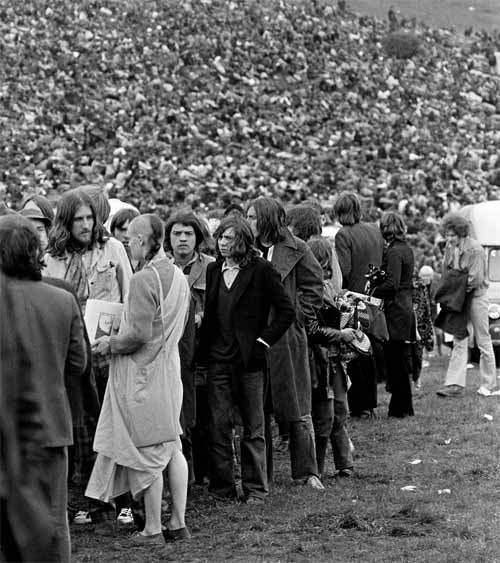 Ramesvara had many direct instructions from Srila Prabhupada in regard to printing his books, and he also gives an eye-witness account of many events that took place while Srila Prabhupada was physically present. Very interesting read!!! 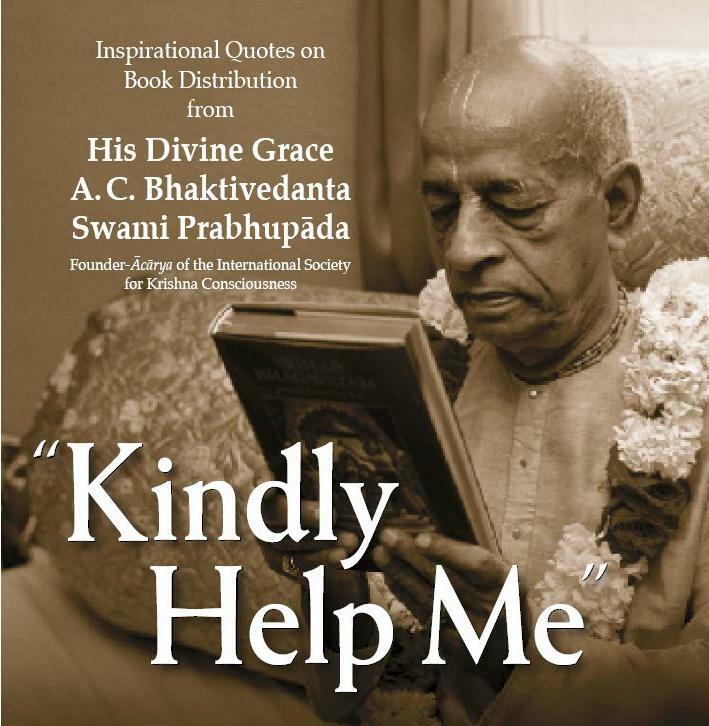 Here are some nice quotes stressing the importance of reading Srila Prabhupada’s books. One has to associate with liberated persons not directly, physically, but by understanding, through philosophy and logic, the problems of life. What we have heard from the spiritual master, that is living. In my books the philosophy of Krishna Consciousness is explained fully so if there is anything which you do not understand, then you simply have to read again and again. By reading daily the knowledge will be revealed to you and by this process your spiritual life will develop.…You may please me the most by reading my books and following the instructions therein and by becoming fully Krishna Conscious in this life time. I have instructed everything in my books. This is a nice post put together by Krishna Path entitled “Accepting the Line of Disciplic Succession”, with some slight editing (highlighting) done by us. What is particularly nice about it, are the Quotes at bottom stressing the importance of reading Srila Prabhupada’s books.